This is a quick to crochet wrap that is good for someone wheelchair bound. The little check pattern adds character without making the wrap too lacy. Size: The sample is 18-½” from neck to edge. The bottom of each of the four panels is 26-½” wide. There is also a tutorial video for this pattern. Chain 131 and finish off. This will form the foundation and ties. Row 2: Ch 3, turn. Shell in 4th dc, ** (skip 2 dc, 2 dc in space between dc) five times, skip 2 dc, shell in next dc. Repeat from ** three more times, skip 2 dc, dc in last dc. Row 3: Ch 3, turn. Shell in next shell, ** 2 dc between shell and 2 dc set, 2 dc between each 2 dc set across the panel, 2 dc between the last 2 dc set of the panel and the shell, shell in the shell. Repeat from ** for the other three panels, dc in the top of the turning chain. Repeat row 3 until wrap is desired size, then finish off with the last row given below. The sample has 37 rows, including the last row. Last Row: Ch 3, turn. Dc in 2nd and 3rd dc, 3 dc in ch-1 sp, (dc in each dc across to next ch-1 sp, 3 dc in ch-1 sp) four times, dc in each of last two dc, dc in turning chain. Finish off and weave in end. The wrap can be made in a solid color or can be made with any number of color changes. The best way to make a color change is to finish all but the very last pull through of the two loops of the last stitch of a row. Cut yarn with a few inches of tail and join with new color next to stitch. Pull new color through last two loops. Weave in ends. Chain 147 and finish off. This will form the foundation and ties. Row 2: Ch 3, turn. Shell in 4th dc, ** (skip 2 dc, 2 dc in space between dc) seven times, skip 2 dc, shell in next dc. Repeat from ** three more times, skip 2 dc, dc in last dc. 6/11/2017 – Added optional larger neck opening instructions. I just wanted to comment on your picture of your Little Checks Wrap and I cannot wait to make this myself. Thank you so much for sharing the pattern. I love this wrap! Any suggestions on making it in different sizes (smaller)? Thanks so much! Easy! Make it as written, but make fewer rows before adding the last row. Just make as many row 3 rows as you like until it is the size you want. It grows evenly, so very easy to adjust size. The beauty of these shawls that are made from the neck down is that you can decide as you make it when it is the size you need. Just keep going until it is just right. I nee to make one for a person that where 2x in clothing. do i need to make changes on the pattern for this to fit?? You could make it a bit longer, but this really is a sort of one size fits all kind of wrap. I’ve been looking for an easy pattern like this specifically for wheelchair bound cuties! I work in an Assisted Living facility that also houses a nursing home and I think my residents who love to crochet could help me make some of these for those in the other part of the building. Thanks!! 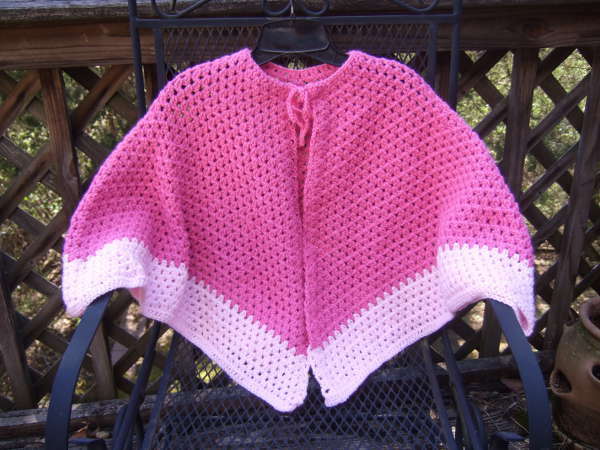 Hello, love this shawl and want to make it in my prayer shawl group. I am a little more advanced than a beginner and am confused on what to do in row 2 and 3. Would greatly appreciate an easier explanation on how to do these rows. I feel very stupid tonight. I got out my yarn and needle and looked again at your directions and it became very clear what the directions were saying. It is easy and is going pretty fast. My sister is in a nursing home, made this wrap for her , she spends a lot of time in a wheel chair and it works out well for her. Her roommate liked it so well I made one for her. Thanks so much for the pattern. finish? I want to make this as a prayer shawl. Thanks. The stitches of row 2 should go across. How many stitches do you have remaining? I only end up with three panels. Hello Mama. You have again given us a great pattern on your site. It is beautiful and very easy and quick to make. I just finished one in Turquoise with four rows of Antique White at the bottom. It is so pretty and I will be taking it in to our Prayer Shawl Ministry get together next week. I love your site and it is my favorite . I have made many of your patterns. Thank you so much for sharing them. How do I print patterns ???????? At the top of the pattern there is a printer icon. Clicking that will produce a printer ready copy of the pattern that you can then print. Thanks, Mama, for the wonderful, quick to work up pattern. It’s peaceful to work on. I’ll be making many for chemo/nursing home. For months now I have been researching sites for just this item. I plan to make one for my granddaughter (10 yrs) and might instead of a neck tie make loops and add cute buttons down the front to close it for warmth. Please advise Mama if you think this might be a good idea. It’s a great easy pattern I will begin one tonight. Sounds like a great idea. I’m glad you found the pattern. I’m making it for my dgd too. She will be 8 and loved the pic I sent to her mother in email. I gave her a choice of two and she chose this one. Hi, perfect pattern! New to crochet and as a wheelchair user this is ideal, I’m always trapping my clothes in the wheels or snagging knits on varouis bits….will use 2 colours as this makes the design look so fresh.Thank you. Wow, i am so making this for my little sister. My wedding is in December and i was looking for some sort of project to thank her for being my flower girl. Thank you for the awesome pattern. Do you make videos ? It’s the only was I can learn. I will add it to my list. I don’t have a good setup for videos right now, so haven’t been making videos lately, but if I do get a setup I’m satisfied with, I’ll put this one on my to-do list. hi I need a video– I am lost on row 2 –I have read and reread it and I am lost– HELP!!! I don’t have a good setup for videos at the moment, but will be working on that very soon. I have a lot of requests for videos, but I’m going to make this one a priority because of getting lots of questions about it. I’ll let you know when I get it done. I’m lost too and am an experienced crocheter. Even in the first row, without ties you said chain 53 but it takes 56 go fit in all the stitches. I found out what I was doing wrong. I was confused about the skip two dc’s in the second row..thought I needed to skp two spaces..anyway got it figured out and as far as the 53 stitches well I guess I should count before I speak.And in the beginning of the row when you said dc in 4th ch I thought you meant 4th from the hook as is usually the case but here if you do that you will be missing one stitch.easy enough to correct though at the end of the row like that. I did have a problem in my instructions. I had an extra dc at the beginning because I didn’t consider that the “turning chain” should substitute for the first dc. I corrected the original comment with this alternative beginning. I disagree with the three chain difference but I was off by one stitch. I went back to that original comment with the non-tie version and changed the beginning to “Dc in the 4th ch. Dc in each of the next 2 ch”. I had an extra dc in there that I needed to take out because the first 3 chains become the first dc. I have experience with crochet but this pattern has absolutely beaten me to death. I am having ultra trouble with Row 2 and Row 3. I have torn my work apart about 4 times now. I have even tried drawing a picture with all the stitches in a circle. Please give me some help. I am planning to give this to my 90 year old aunt. Thanks. Once you make it through a couple of rows of this, it will be really easy and quick. After the first row, you will always be making pairs of dc stitches in spaces rather than in other stitches. You will be putting these pair of dc stitches between every two dc stitches of the first row so that the first row becomes pairs of dc stitches. This is what creates the checked look. In this tutorial they are crocheting one dc between each dc. In this pattern I am putting pairs of dc between pairs of dc. I nee to make one for a person that where 2x in clothing. do i need to make changes on the pattern for this to fit? ?At the begaining we do not have to start with a bigger chain in order for it to fit right accross the sholders???? It should be fine as is, but you could make it a little longer. It doesn’t have shoulder shaping, just draping after the shoulders. I love to read and do puzzles in bed at night but my shoulders get cold and wearing a robe gets too warm and fabric bunches us – THIS IS PERFECT!! It is like a bed jacket but you can’t find them in stores anymore. I think I will actually make one for myself!!! Love it. The easiest way is to crochet two extra chains, cut the thread, pull it through and pull tight. I got to row 2 and am having difficulty. It seems after I get to repeat the info in parentheses three times I am stuck.do I need to shell again too? Also it seems to be missing a panel. I shelled as described but the neck area keeps coming out awkward shell, sts, shell, sts, no more shell to turn it for the neck and create two other panels. I just can’t figure out what I am doing wrong.even if I shelled after repeating the stuff in parentheses three times it would miss a panel. Sorry, I’m lost and I’ve crocheted before. I am so sorry I am just now getting back to you on this. The instructions after the ** are repeated “three more times”, so four times total. So there are 5 shells total per row and four panels. I just love this pattern and have started it. I understand about the sizes being able to be adjusted based on the rows but as I’m a little confused on the panels. Is it one panel that grows or do I have to do several patterns and put them together. At first I was thinking I would just add rows and it would grow as I do it. Is that correct? Thank you so much. I am so sorry I am just now replying to your question. The wrap is worked in one piece. Instructions for each “panel” are repeated four times across each row. You are correct that adding rows will be all you need to do to increase the size for the wrap. Has a video been made on this? I am a beginner but love this wrap. I have tried making this, but have chaining the 131 chains and finishing off, how do you forma new slip knot and then skip 40 chains? Is that the 40 chains on the original 131 chains that you do the slip knot? Very confusing, please help. Also, panels. Do you do 4 panels and then put together? Or is this a one piece wrap? Please advise. Thank you. I haven’t made a video for this one yet but hope to in the future. Of the 131 chain beginning chain that you make, you will not be using the first and last 40 chains. These will form the ties of the finished wrap. You will be working on the remaining center 51 chains. Form another slip knot loop just as you always do to begin a crochet project. You will make a dc in the 41st chain and work the first row across the next 50 chains. If you have difficulty making a dc with just the beginning slip knot loop on your hook, alternatively you can make a slip stitch in the 41st chain and chain three to count as the first dc. So I get to the end of row 1 – what do I do about the 40 stitches it says to skip? Do I make it like the other end, i.e. slip stitching at the end of all the stitches and join with a slipped stitch? Never mind; I looked at the picture and have conquered my confusion… and loving the pattern. Thank you for this pretty pattern. My elderly-though you wouldn’t think so-aunt loves ponchos. I’ve made her a few, but I’ve been looking for something different. I think I’ll try your pattern, one of two ways, depending; if I were to close up the front like a normal poncho, will the opening be large enough to fit over a normal size adult head? If it won’t, then I’ll just make it the way it’s written, add some button loops and buttons. Thank you. This fits too closely to the neck to pull over if closed all the way up, but you might consider making it open for 12 or 15 rows and then overlapping the two front edge panels and then continuing around with it closed. That would make a henley style neck and would be big enough for a pull-over. I made the fans and pansies shawl too and REALLY loved it. I finally found a pattern I can make for chemo patients at the hospital I work. I am glad I read all the views on it so I can have additional info on this. it does sound confusing in parts, but you have cleared them up for everybody. sometimes wording in patterns can be confusing. I will write the info you answered other’s questions into my pattern so I can remember the instructions. thanks for explaining it all. it helps. I just got finish making this, but I need to know if you do 37 rows is this to long for a toddler? It just depends on how long you want it. It would probably come on down almost to the feet of a toddler. It can be made shorter or longer by subtracting or adding rows. I live this! I would like to make a summer version for my mother with some super fine yarn I have. How should I adjust the pattern for such a thin yarn? I did this conversion based on 32 sc per 4 inches with a size B (2.25 mm) hook. The beginning chain should be 295. The first 90 and last 90 chains should be skipped. These will form the tie. The middle 115 will be used for the collar. Row 1 is the same except that each occurrence of “dc in next 8″ should be changed to 24. Row 2 change “five times” to thirteen times. You will need to add more rows than what I have called for, but just keep adding rows until it is the length you like. Thank you so much for this lovely pattern. I have looked high and low for an easy shawl pattern that works up quickly. I’d like to make several before Christmas for residents of a local nursing facility. I watched your video and don’t even need a pattern. Once you got to the part where you were working in spaces, there’s no need for a pattern or video until perhaps the end. If anyone has questions about anything in the pattern, please give the video a try and all will be explained. Again, thank you for a lovely shawl video and pattern. It can be as long or as short as you like. Additional rows make it longer, so it can be completely made to custom sizes. Yes,I am a male who crochets. My grandmother taught me when I was a child and I still do crochet now that I am married and 52 yes old. Can you explain how to start this without the ties in the beginning chain. I am not fond of ties on a shaw. Thank you for sharing your pattern. Row 1: Dc in the 4th ch. Dc in each of the next 2 ch, 2 dc in next ch, dc in each of next 8 ch, (2 dc in next ch, dc in next ch, 2 dc in next ch, dc in each of next 8 ch) three times, 2 dc in next ch, dc in each of next 4 ch. Continue the rest as in the pattern. Thank you for this pattern. I am going to make this for my Grandmother who is in the nursing home with Alzheimer’s. She will love it. God bless. 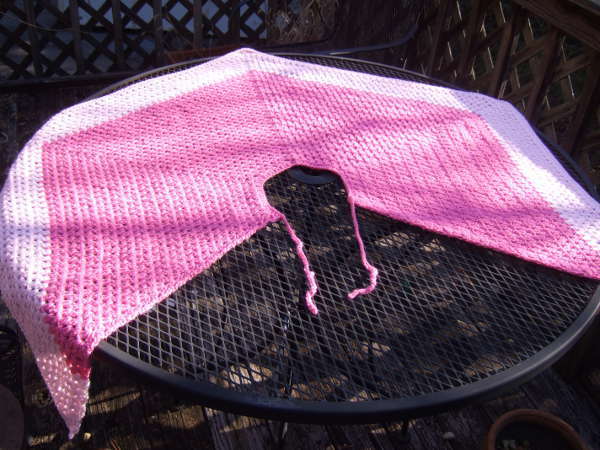 I am excited to make this shawl as a prayer shawl but would like to use a light-3 yarn instead of worsted-4 yarn. Can you tell me if I will need to adjust the pattern. I am making it for a sick, elderly relative who lives in FL so I would like it to be soft and light. Also, I plan to make it as SCOTT did, without the tie. Use a 6 (4mm) hook. Row 1: Dc in the 4th ch. Dc in each of the next 3 ch, 2 dc in next ch, dc in each of next 12 ch, (2 dc in next ch, dc in next ch, 2 dc in next ch, dc in each of next 12 ch) three times, 2 dc in next ch, dc in each of next 4 ch. I am making this beautiful wrap. I need to know how to decrease the pattern it is too wide.I need to work now in even stitches to make it longer. Once it is as wide as you want and you mostly just want to add length, you can just make 2 dc in the shells (except for the first and last shells). There will still be a very slight increase on each row, but much less than when making all the shells. Is it possible to make this info a cape? Would I just continue with the same pattern throughout to do that? You can just continue it and it will get longer and longer. It will also get fuller, so just keep that in mind. Hello! I made this as a gift for my mother and I’m glad you had added the video when I made it, and once I got past the first three rows it was so easy and went by so quickly!! I was considering putting a boarder (sc) all the way around but I’m wondering how you do that on the sides where the chain 3’s are. Would I go into each individual chain on the sides or around the whole set of chain 3’s? Does that make sense? By around I mean put the hook into the space between the row of chain 3 and the last dc in the shell; so one sc for each set of chain 3. I am not very good at ” doing my own thing”, I need a pattern to follow. Any help or suggestions you can give me would be appreciated! Those ch-3’s are replacing dc stitches on the turns. I would treat them like you would the dc stitches. You may have to play with it a bit to see what works best with your tension. You don’t want it to be too lose and ripple or too tight and pull. I usually either try to sc loosely around and put two sc in the side of dc’s (and therefore 2 sc per ch-3). Sometimes it seems like 3 sc per dc is too much and it makes it ripply. I’ve also done an every other thing, 2 for one and 3 for the next. You could try sc in each ch and two sc in the sides of the dc’s. I have been plucking up the courage to do your ” little checks wrap” I love it so I have tried it its very nice but it’s a bit different to yours , I followed it as best I could but the back is longer than the side panels, so don’t know where I’ve gone wrong . It does look nice though , but mystified as why. Thanks for a lovely site . I have 2 skeins of Joanns’s Rainbow boucle. I am going to make a baby blanket for a new grandson. What are your thought s on using double strands of yarn for your no chain patterns? They work great with double strands. Go up a few hook sizes. I’m going to make this for heavier patients and find the neck opening to be a little small. How can I increase this and then complete the rest of the pattern to match the added dimensions? I like this idea. I’m going to add these to the original pattern as well as an optional larger neck opening. What a great pattern! I volunteer at an extended care facility where everyone is always cold. I’ve used “leftover” yarn, yarn given to me by family when someone dies. After six wraps I’ve used a lot of yarn by combining yarns into pleasing patterns. The pattern is easy to do and and the wraps easy to use and my yarns are dwindling so I won’t feel guilty when I replenish.